The Jeju Massacre took place in 1948, saw the deaths of thousands of residents of the island's villages as they were caught up in a struggle between government forces and rebels. A recently established 4.3 Trail is a historical walking path that visits some of the locations affected in the area and tries to help visitors get a better understanding of the events of the time. 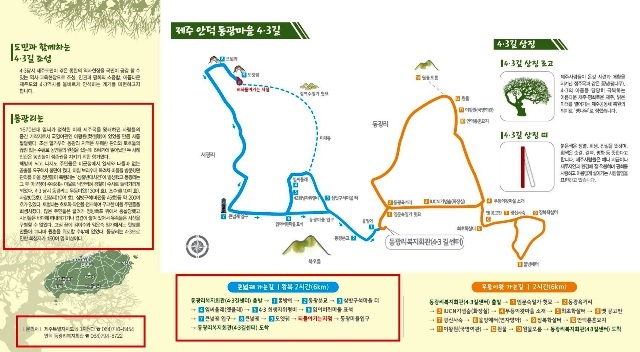 There are two trails that start in Donggwangri - one that heads towards Mudungeewat and one that heads towards Keunnolbgwe cave. Each trail is around 6 km and it would be possible to do them both in one big 12 km loop. Here are some of the important sites you will find on the Keunnolbgwe trail. Dongwangri has been historically important in Jeju since the Lim family settled here in the 1670s. During this time, the village was an important stopover for people traveling to Jejumok. Late in the Joseon dynasty, the village was exploited by corrupt officials. This led to two uprisings in the 19th century as the villagers tried to protect their living. At the time of 4.3, Donggwangri had about 200 houses. This included 130 households in the surrounding villages of Muddeongiwat, Josugwe, Sajangbat, and Ganjangri. During 4.3, officials sent out orders that anyone living further than 5km from the coast was to be executed on sight. This scorched earth policy particularly affected the Dongwangri area and many innocent villagers were killed. Many of the villagers were shot to death at Jeongbang Waterfall. It is said that the families of the murdered villagers could not find the bodies because most of the dead were either swept away by the ocean or piled up too deeply. The families of Kim Yeo-su and Lim Mook-suk later decided to create an artificial tomb to remember the dead. In total, around 160 villagers were killed in this area during 4.3. Since ancient times, Jeju has harvested barley. Horses were then used to process this barley using a machine called a malbangae. Each malbangae served around 10-20 households. The device works when horses pull rocks around the mulbangae. When the upper and lower rocks interlock with each other, they peel the skin of the grains trapped in between and grind them into a powder. The malbangae in this area moved to its current location in the 1960s. In 1948, this school was burnt by a punitive expedition. In January the following year, the school was closed before being integrated into Andeok elementary school in March 1949. At the time of 4.3, each grade had only one class of around 30 students. There were four grades which made up a total of 120 students. This village was also called Majeondong because villagers here used to harvest hemp in order to make clothing and rope. At the time, 46 families lived here together. During 4.3 they scattered to find hiding places, such as Keunneolbgwe cave, to avoid the scorched earth policy. In January the following year, many of the villagers were shot to death near to Jeongbang Waterfall. However, their houses remain and their descendants still do farming in the area. Doetgwe is a cave that, along with Keunneolbgwe, was used by villagers from Donggwang as a hiding place during the 4.3 incident. The cave itself stretches out for 30 meters and used to be connected to Keunneolbgwe. On the floor of the cave, there still are some supplies that were used by the hiding villagers. 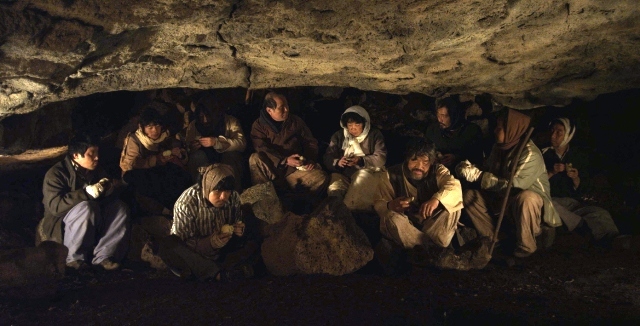 This cave is also the location that was used to shoot the 4.3 movie “Jiseul”. Five households of the Lim family used to live here. Before the events of 4.3, they lived together happily, helped each other in their day-to-day tasks and performed ancestral rituals together. Fourteen people who lived here, including five family members of Lim Moon-suk's family were killed.